Pet stain odor is a very common problem that could be much more complex than on first impression. 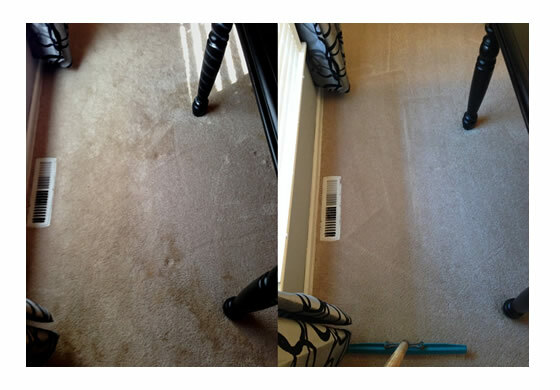 Pet urine can easily soak through the backing of the carpet into the padding underneath. In more severe cases the urine can penetrate into the sub-floor beneath the padding. To eliminate this problem, the urine must be removed or neutralized from each of the layers affected. If the contamination is limited to only the face yarn of the carpet then the cleaning itself may effectively remove the odor. To eliminate pet odors we offer a service called a "pet flush." The process consists of flooding the the pet urine spot with enzymes and odor counteractants. We then rinse and extract all the detergents and urine away with a sub-floor extraction tool. A flush covers about an 18" diameter spot and costs $20 per pet flush. This can be a costly service, so we only recommend it if the pet urine is confined to a small area or if we can identify exactly where the pet urine is on the carpet. 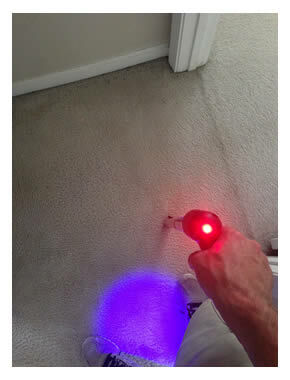 We can assist finding the spots with a powerful UV flashlight. Keep in mind that the pet urine is usually 25% larger underneath. For more severe cases where pet urine covers an entire room it might actually be cheaper to replace the carpet and padding. Even if replaced, the sub-floor may need to be treated with Killz. In some cases our (free) deodorizer treatment will effectively remove pet odors. However, we do not guarantee this. Sometimes additional steps that go beyond cleaning are necessary to permanently remove pet urine odors like performing a pet flush. Keep up with specials and updates! Enter your e-mail and subscribe to our newsletter.